Last month I had a chance to visit Little Bighorn in Montana. We opted for a bus tour of the battlefield. Our guide gave a good overview of the story, but there was a lot missing. Having visited this historical site, I decided I wanted to know more. Nathaniel Philbrick’s book The Last Stand filled in the gaps. In retrospect, I would have loved to have read this book before I visited the actual site. Our guide pointed out many of the famous locations such as Reno Hill and Weir’s Peak. But the names and locales meant little without the background information. 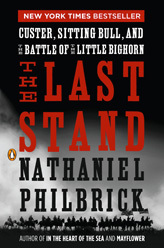 Nathanial Philbrick’s book is a detailed account of all that went on before, during, and after Custer’s Last Stand. I was well aware of the mistreatment of Indians by the US Government. This book only reinforced that notion. Custer, in particular, was callous and cruel in his total disregard for human life. He thought nothing of killing Indian women and children if it furthered his reputation as an Indian fighter. Sitting Bull, on the other hand, was a decent person who wanted only to be left alone. He didn’t want any government handouts. His refusal to abide by President Grant’s ultimatum set things in motion for the Little Bighorn battle.The battle itself was ill-conceived from the start. Custer’s inexperienced soldiers, some of whom had never fired their weapons, were exhausted and in need of sleep before the battle even began. So too were their horses. Custer’s decision to attack the Indian encampment even after realizing that he was outnumbered was a fatal mistake. Custer was an egomaniac. His goal from the outset was to have a battle win that he could then tout during a proposed book tour and a potential run for the Presidency. He didn’t care who got killed in the process. In the end, Custer got what he deserved. He was no hero. Had he simply road his horse into the encampment and talked directly with Sitting Bull, chances are good that he could have achieved his goals without a single loss of life. After reading the book, I rented the movie Little Big Man. If you really want a deep dive into the Little Bighorn, read Nathaniel Philbrick’s book, watch Little Big Man and the documentary American Experience: Last Stand at Little Bighorn. Then get yourself to Montana and take the drive by audio tour of the Little Bighorn.